Buy some metal whisks from the dollar store, fill them with chocolate kisses or other candy, then wrap in cellophane and label with your best wishes for Christmas. This is a small homemade gift that is easy to put together, yet is very pleasing to receive. It’s a great choice when you want a small something or other for your child’s teacher or for your neighbour (or her children) who live across the road. 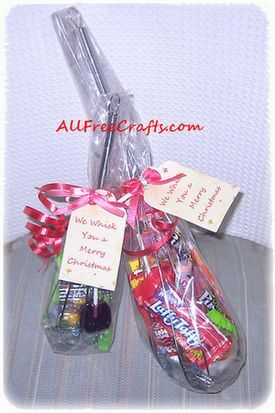 Arrange the wrapped chocolates or other candy inside the whisk, pushing each piece between the tines of the whisk. Keep adding candy until the inside of the whisk is as full as you can make it. Set the filled whisk on a cellophane sheet and draw the cellophane around the whisk in a natural cone shape to enclose the whisk entirely. Fold the edges of the cellophane around the wide end of the whisk and fasten in place with invisible scotch tape. Also attach tape somewhere around the middle of the whisk, at the back, where the edges of cellophane overlap. Cut the cellophane approximately one inch above the top of the whisk, fold it over toward the back and tape in place. 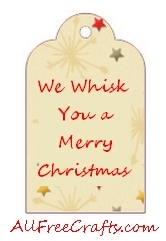 Either print and cut out our label, which says “We Whisk You a Merry Christmas” or write your own. Using thin curling ribbon, tie the label to the middle of whisk, just above where the whisk wires join together to form the handle. Curl the ends. If desired, you can attach a small ribbon bow as well as the label. These are very easy to make yourself, using thin ribbon woven around the tines of a table fork. – for someone who likes cooking, fill the whisk with small cooking items – wrapped organic bouillon cubes, for instance, or small tubes of candy sprinkles and colored icing. – for a home warming gift, add one or two whisks to a mixing bowl, along with a few other kitchen tools. 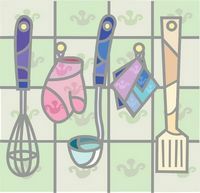 You could also add a pot holder and towel set and a couple of packaged muffin mixes. Enclose the bowl in cellophane and label as desired.